Willie Mae “Big Mama” Thornton was a blues singer and songwriter whose recordings of “Hound Dog” and “Ball ‘n’ Chain” later were transformed into huge hits by Elvis Presley and Janis Joplin. Willie Mae Thornton was born on December 11, 1926 outside of Montgomery in rural Ariton, Alabama. Her father was a Baptist minister and her mother was a church singer in his congregation. Thornton’s mother died when the singer was 14, and she left home to pursue a career as an entertainer. She joined the Georgia-based Hot Harlem Revue as an accomplished singer, drummer, and harmonica player and spent seven years as a regular performer throughout the South. Following her years as a traveling blues singer, Thornton moved to Houston in 1948 to begin her recording career. In Houston, Thornton joined Don Robey’s Peacock Records in 1951, often working closely with fellow label artist Johnny Otis. Her professional relationship with Otis and Robey proved fruitful for Thornton, who, along with “Little” Esther Phillips and Mel Walker, toured with Otis. Their tour traveled throughout the eastern and southern United States, including benchmark shows at Houston’s Bronze Peacock and Harlem’s Cotton Club. One of Thornton’s earliest and most popular recorded tracks was “Hound Dog,” initially released by Peacock in 1953. Thornton’s version of “Hound Dog” topped the R&B charts for seven weeks and sold over two million copies nationwide. Though the song brought acclaim to Thornton, it only yielded her about $500. The song became even more popular as Elvis Presley’s first hit record in 1956. As the popularity of Thornton’s traditional blues style waned in favor of the newer rock sound, she moved to San Francisco in the late 1950s and performed for several years without a label or promoter until the resurgent interest in traditional blues of the early 1960s again brought attention to her work. In the 1960s, Thornton recorded albums for the Arhoolie and Mercury labels, including collaborative albums such as Big Mama Thornton with the Chicago Blues Band (1967) with Muddy Waters and Ball ‘n’ Chain (1968) with Sam Lightnin’ Hopkins. Additionally, she was regularly featured at the Monterey Jazz Festival in San Francisco and American Folk Blues Festival throughout Europe. Though Thornton’s popularity continued to surge throughout the 1970s, her health deteriorated due to years of heavy drinking. As her unreleased material was gathered together for albums such as Saved (1973), Sassy Mama (1975) and Jail (1975), Thornton struggled to make performance and recording dates, including the 1979 San Francisco Blues Festival, where she needed assistance to mount the stage. As a final act of dedication to the blues, Thornton recovered from an automobile accident in the early 1980s to perform at the 1983 Newport Jazz Festival with artists such as Muddy Waters, B.B. King and Lloyd Glenn, producing a final album The Blues…A Real Summit Meeting. 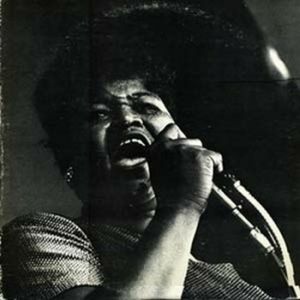 Willie Mae “Big Mama” Thornton died in Los Angeles on July 25, 1984 at the age of 57 from complications resulting from a heart attack. Tony Russell, The Blues: From Robert Johnson to Robert Cray (Dubai: Carlton Books Limited, 1997); Tina Spencer Dreisbach, “Willie Mae ‘Big Mama’ Thornton,” The Encyclopedia of Alabama, http://encyclopediaofalabama.org/face/Article.jsp?id=h-1573; Alan Lee Haworth, “Thornton, Willie Mae [Big Mama]” http://www.tshaonline.org/handbook/online/articles/fthpg.